Located in the center of Krakow, in the green area on the Wisla River, the Novotel Krakow Centrum hotel was opened on the first of March 2002. It is ideally located only 10 minutes from the magnificent Royal Castle Wawel. Just 150 meters from the hotel you will find famous Market Square called "Rynek", with numerous shops, galleries and museums. 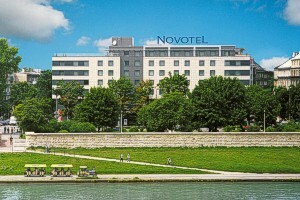 New Novotel is in straight line with the International Airport Krakow Balice from where you can take a flight to major cities as: London, Paris, Vienna, Rome and even New York or Chicago. An easy access to motorway A4 or main road E7 guarantees no problem when you travel by car. Guests will relax in a modern wellness center with a swimming pool, Jacuzzi, Finnish sauna, fitness room and massage services. The Novotel Centrum features 198 air-conditioned rooms opening to a remarkable view on Wawel as well as in the Vistula river. All rooms are air-conditioned and soundproofed. Guests will enjoy a double bed, sofa, working desk, direct dial telephone, and satellite/payTV. Small safe deposit boxes are installed in each room where the precious goods can be stored. The hotelÂs restaurant serves traditional Polish and international cuisine. Guests will also relax or meet friends in the hotelÂs lobby or bar. The hotel is open 24h and features facilities of a wireless Internet access, boutiques and shops, garage, car park, security service, shoe shine machines, beauty parlor, laundry service, car rental and iron at the reception. 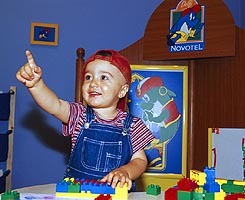 The hotel is specially friendly for families with children. There are many gifts waiting for children at the restaurant. If two children under 16 years old share their parents' room, they sleep and have breakfast for free of charge. For a bigger family second room is for 50% price. There is also a play room for children and special price policy for families with children. Fur business purposes the hotel provides modern business center, and printing/fax/computer services. We look forward to welcoming you at the Novotel Krakow Centrum hotel. Taxes are included in the rates. Novotel KrakĂłw Centrum is situated in the city center, next to the crossing of T.KoĹciuszki and Z.KrasiĹskiego Avenue. From the Railway station, go down Pawia, Warszawska Street to SĹowackiego Avenue. Follow the sign /Novotel and Ibis on lamppost/ down to avenues to Debnicki bridge, where you must turn on the right into Kosciuszki Street. From the InternationalÂ Airport Balice take the direction centrum via Ksiecia Jozefa street to Kosciuszki Street.